Whether it's a romantic dinner for two on your backyard patio or a formal dinner party with your best china and linen, set the mood and illuminate the occasion with the understated elegance of Root dinner candles. Rising from the table with symmetrical simplicity, Arista's beeswax blend burns with a pure, natural scent and lasts up to 50% longer than ordinary dinner candles. 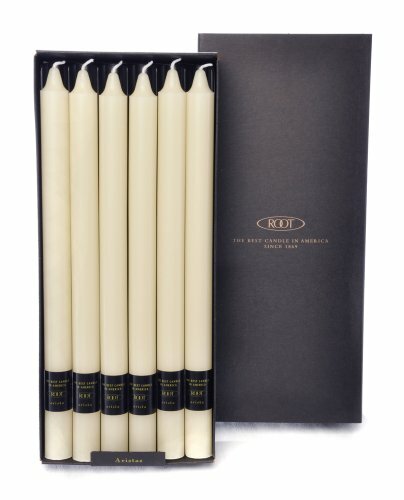 Box of 12, 12-inch candles, each burning up to 18 hours. Root Candles continues the values, knowledge, and zeal that founder Amos Ives Root kindled over 140 years ago; each candle is crafted with quality, innovation and excellence. If you have any questions about this product by Root, contact us by completing and submitting the form below. If you are looking for a specif part number, please include it with your message.